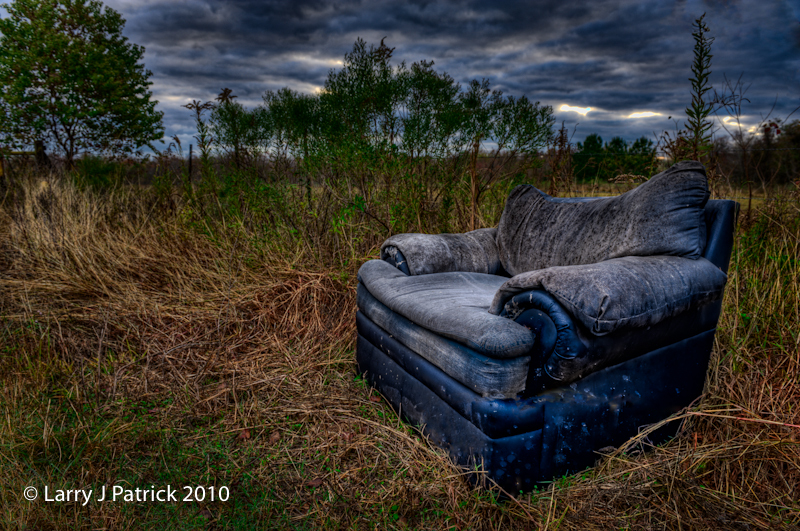 I was out scouting for a location for an upcoming portrait session when I saw this old blue, leather chair setting in the middle of the field. It looked so out of place and unusual that I decided that I needed to take a picture of it. I wanted to show all the details so I decided to use HDR. I shot five exposures ranging from –EV2 to +EV2. Camera settings: Nikon D3, Nikon 24-70mm f/2.8 shot at 24mm, ISO 200, f/13 and five exposures ranging from 1/250th to 1/8th of a second on a tripod. Photomatix Pro—combined four of the exposures into an HDR image and tone mapped the image. Photoshop CS5—remove a few distracting details and used nik Color Efex Pro tonal contrast to enhance details in the chair. Unusual. Not sure I would have taken a photo of it. Then again, I find myself studying it and wondering why it is in the field. Cool colors but not too exciting subject. Nice photo Larry. I like this type of shot a lot with the juxtaposition between the grungy old chair and the beauty of nature, with a surprise on top!